Prepositions are some of the most common words in the English language. We explain how your child will learn to use them in primary school and why time connectives are so important in non-fiction writing. Prepositions are linking words in a sentence. We use prepositions to explain where things are in time or space. Prepositions tell us where something is (for example, beside, under, on, against, beneath or over) or when something is happening (for example: until, during, after, before or more specifically 'on Christmas Day', 'at twelve o'clock' or 'in August'). Prepositions usually sit before nouns (or pronouns) to shows the noun's (or pronoun's) relationship to another word in the sentence. When and how are children taught about prepositions in primary school? In the Foundation Stage, children may be asked to describe the position of an object, using words such as next to, under, in, on, opposite, beside, etc. This will help them expand their vocabulary which will in turn improve their speaking and writing. 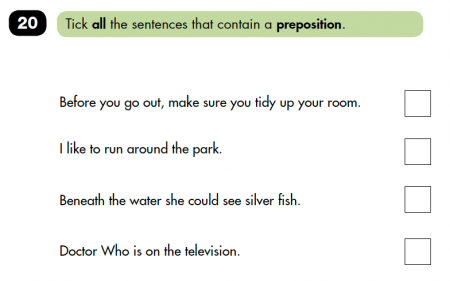 According to the national curriculum (revised in 2014), children are formally introduced to prepositions and the role they play in a sentence in Year 3. In KS1 and KS2 children use a greater variety of prepositions. In particular, when children use prepositions to tell us when something is happening, they are also referred to as time connectives. By Year 6 children are expected to know the difference between a preposition (used before a noun; for example: 'I sat before the fire.') and a subordinating connective (used to introduce a subordinate clause; for example: 'I had to learn the vocabulary before I could complete my homework.'). Children will be encouraged to use time connectives in lots of different kinds of writing in Years 1-6. Time connectives are often used in fiction, but are also used in non-fiction genres such as recounts, biographies, instruction texts and information texts. Teachers will often have a list of time connectives on display in the classroom for children to refer to when they're writing. First, boil some water in a saucepan on the stove. While the water is swirling, crack your egg and drop it in the water. Leave the egg in the water for two minutes. Finally, remove the egg from the water with a spoon. Children will need to know about the different kinds of prepositions and how to use them by Year 6 in preparation for the KS2 Grammar, Punctuation and Spelling test. In this case the last three sentences should be ticked (the prepositions are around, beneath and on). In the first sentence the word 'before' is not used as a preposition but as a subordinating conjunction (because it introduces a clause, Before you go out). Being able to distinguish prepositions and subordinating conjunctions is a particularly tricky aspect of the Y6 SPAG test; the words when, after, until, before and since can be used as subordinating conjunctions or as prepositions in sentences. To get it right every time remember that if the word introduces a clause (a group of words including a verb) it's a subordinating conjunction. If it explains the position of something it's used as a preposition.